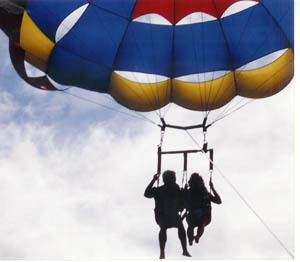 Dangling 800 feet above the ocean in a sling chair didn’t appeal to my husband, but after learning we could go tandem, he agreed to try parasailing. We arrived at Mala wharf at Lahaina Harbor on Maui wearing bathing suits (although you probably won’t get wet) and climbed aboard a high tech speed boat to motor into open water of the Pacific Ocean. Once sufficiently out in the water, we donned life vests, positioned ourselves on the slight seats, and strapped in. 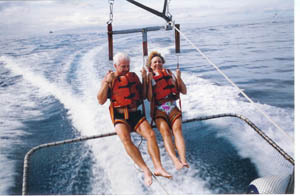 Unlike the time I parasailed by lifting off directly from the beach in Mexico, we launched effortlessly from the boat by a hydraulic winch system on deck. Slowly, as the attached cable was released and the colorful parachute inflated, we rose higher and higher, conscious of wind and sun on our bodies. Soon, views of white, fluffy clouds above and the blue sea below rippling from our boat’s foaming wake filled our senses. It was pure pleasure! It’s eerily quiet and peaceful when you’re drifting in the air over the ocean, feeling far away from overcrowded resorts. That’s the lure of parasailing: an opportunity to become part of the natural environment while viewing ocean scenes from a lofty perspective. Riders can go alone (must weigh at least 130 pounds), in pairs, or triple (combined weight cannot exceed 400 pounds). Rides soar either 800 feet (38 stories) or 1200 feet (50 stories) high, depending on choice and weather conditions. Children 6 to 12 years of age must ride with a parent or guardian. Time in the air is about eight to ten minutes, and if you’re game the crew will thrill you with a “touch ‘n’ go,” where they slow the boat down and allow your toes to skim the water’s surface before rising again. Even though we took our own pictures while floating above the sea, the crew was also busy recording our adventure. Their included photos perfectly captured the broad smiles that covered both our faces and the feeling of pure exhilaration during this fun and exciting adventure in paradise.